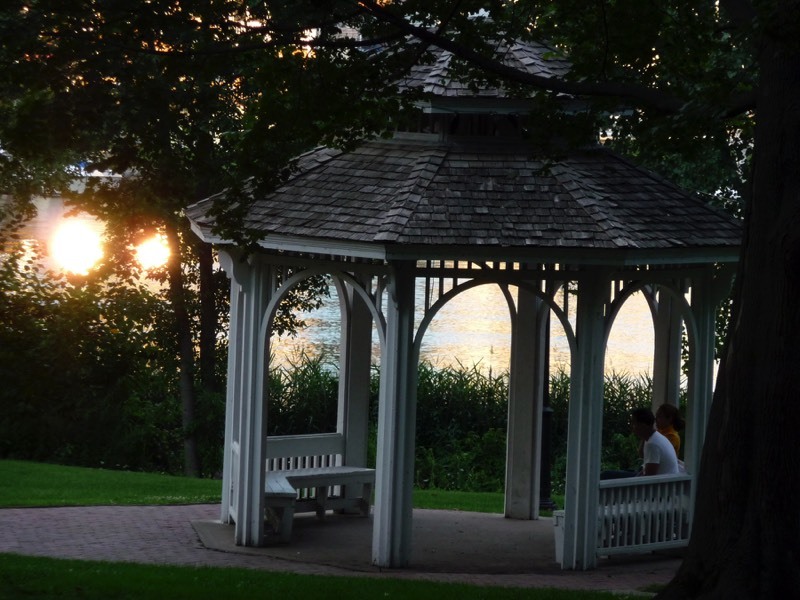 Pawtuxet Park is located in Warwick, RI and it is a popular destination for visitors and residents of all ages. Located on the banks of Pawtuxet Cove, it is situated in historic Pawtuxet Village, where it is said prisoners from the infamous British packet boat "Hannah" were captured after the sinking of the HMS Gaspee. Local events take place in Pawtuxet Park from the Annual Arts & Crafts Festival organized by the Gaspee Days Committee to weekly summer concerts scheduled by the City of Warwick. This is where Friends of Pawtuxet Village hosts events such as our Annual Halloween Happenings, which kicks off from here in October, and it is the location of the Children's Christmas Tree and luminaria lighting coordinated in December by Friends of Pawtuxet Village. We encourage summer weekly Chess in the Park on the marble chess tables, which were purchased by Friends of Pawtuxet Village and donated to the City of Warwick for the enjoyment of local youth and chess lovers. During warm weather, visitors and locals come to our lovely Village and sit in Pawtuxet Park on picnic tables available for lunch breaks and evening liaisons. Families bring their children to enjoy the swing-set and youth are seen having informal football or baseball games on the two acres of grass. Yoga classes are sometimes held here and the Pawtuxet Rangers Fife & Drum Corps practice in the park during warm weather. Be sure to check out the horse-shoe pit found on the edge of the parking lot as you enter the park! Wedding couples of all ages have hosted weddings inside the well known landmark Gazebo in the park, and high school prom dates often are seen taking photos on the same spot. The Aspray Boat House is owned by the City of Warwick and managed by the Gaspee Days Commttee (GDC). There is a fee to rent the boat house and insurance coverage is required. For questions about use of the Pawtuxet Park and the Gazebo, contact the City of Warwick, Parks and Recreation Department (401)738-2000. June: Gaspee Days Parade; Gaspee Days Sunday in the Park; Pawtuxet Rangers Encampment; Symphony in the Park and Fireworks. June-July: Every Wednesday 6-8PM — Pawtuxet Rangers Fife & Drum Corps practice in the Gazebo; June-August Every Thursday 6-8PM — Chess in the Park.